Northeastern China has become a new magnet for foreign investors, as the former heavy industrial hub tries to regain its shine by opening up wider to the world. The German carmaker BMW announced Thursday that they would extend the contract term of the joint venture BMW Brilliance Automotive (BBA) in Shenyang, capital of Liaoning Province, and increase investment for its production capacity expansion. The extended contract is valid for 22 years from 2018 to 2040, the BMW Group said together with its partner Brilliance China Automotive Holdings in the context of the 15th anniversary of BBA. Meanwhile, the BMW Group will invest more than 3 billion euros (US$3.5 billion) in new and existing plant structures in Shenyang over the coming years. In Tiexi, a new plant on the existing plant grounds will double the site's capacity, while extensive remodeling and expansion measures will target the neighboring plant in Dadong. 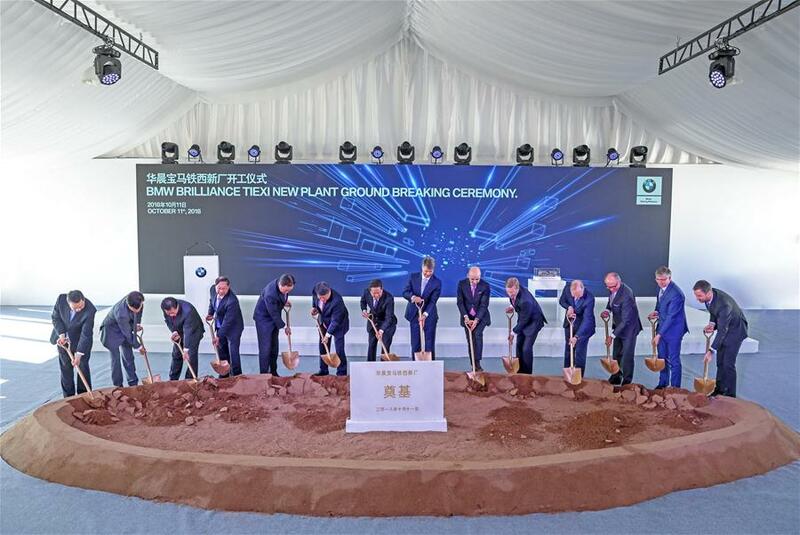 The groundbreaking ceremony for the new BMW Brilliance plant in Tiexi district in the city of Shenyang was held on Thursday. In the following three to five years, the total annual production capacity of BMW automobiles at the BBA plants will increase to 650,000 units, creating 5,000 new jobs. According to a press release posted on BMW Group's website, the company intends to increase its stake in BBA from 50 percent to 75 percent. This transaction is subject to the approval of the relevant authorities and the consent of its partner's Shareholders' Meeting, it said. "BMW Group has become the first beneficiary since China relaxed the joint-venture equity limit for the automobile sector, starting a new journey for the integrated development and mutually beneficial cooperation of the auto manufacturing sectors of China and Germany," Chinese Premier Li Keqiang said in a congratulatory letter on the breaking ground for the new plant Thursday. This year marks the 40th anniversary of China's reform and opening-up, Li said, adding that China will open its door wider and wider, further relax market access and create an equal and constantly optimized business environment for domestic and overseas companies. Foreign companies are welcome to expand cooperation with China to better realize common development, Li said. Germany welcomes China's deepening of its reform and opening-up and the relaxation of market access, and hopes the bilateral cooperation can produce new achievements, German Chancellor Angela Merkel said in a congratulatory letter Thursday. China has said it would ease restrictions on foreign ownership in the country's joint-venture car makers. Previously, China would cap foreign stakes in joint ventures in the domestic auto industry at 50 percent. Premier Li has said the new project indicates that China's new opening up measures are being translated into concrete actions, when meeting Wednesday with Harald Kruger, chairman of BMW Group. "In the future, these measures will be even stronger, a higher level of opening up will be established, and China will continue to be a hot place for foreign investment in the long run," he said during Wednesday's meeting with Kruger. In recent years, China has reduced the number of restricted measures on foreign investment by nearly two-thirds, and also significantly reformed the approval system for foreign investment. In June, China unveiled a shortened negative list for foreign investment, cutting the number of items down to 48 from 63. The new list widens market access for foreign investment in primary, secondary as well as tertiary sectors. It also details a timetable for opening up in the automobile and finance sectors. Foreign investors' confidence has constantly been reinforced, as a result of the vitality of the Chinese market being further stimulated by an improved business environment. In the first six months of 2018, foreign direct investment (FDI) into the Chinese mainland rose 1.1 percent year on year to 446.29 billion yuan, according to the Ministry of Commerce. In dollar terms, FDI inflow grew 4.1 percent to US$68.32 billion in H1. Northeast China -- made up of Liaoning, Jilin and Heilongjiang provinces -- has been struggling with growth due to shrinking resources and industrial overcapacity. "Investment does not go beyond the Shanhaiguan Pass," it is said, referring to a geographical division between northeast China and the rest of the country. But BMW Group is a pioneering foreign investor going beyond the Shanhaiguan Pass and doing well in Shenyang. It set up the joint venture BBA with Brilliance China Automotive Holdings in Shenyang in 2003, when China launched the first round of its strategy to turn its rust belt into modern industrial zones. The city has become the German carmaker's largest production base worldwide. In total, BBA employs more than 18,000 employees. Since its founding, the supplier network has expanded to over 350 companies. More than 80 suppliers have set up locations in Liaoning so far. "Fifteen years of BMW Brilliance is a joint success story that we share with our partners and over 18,000 associates. With this additional investment, innovation and job creation, we will continue our high-quality development and drive economic growth in Liaoning Province," Johann Wieland, president of BBA, was cited as saying in a press release. The central government rolled out new measures to revitalize its old industrial base in northeast China in 2016, and set up a free trade zone in Liaoning last year. The economy of Liaoning is now showing signs of recovery, and a growing number of global investors have started taking root or increased investment there. Last year, Michelin, the world's leading tire maker, invested 300 million euros to expand its factory in Shenyang, while New Zealand company Richina started a leather industry project with a total investment of US$900 million in the city of Fuxin. Statistics released from the provincial department of commerce showed that Liaoning's actual use of foreign investment reached around US$3.7 billion in the first eight months of this year, up 15 percent year on year. Wieland added that China's wider opening up has sent positive signs about foreign capital and has brought new opportunities for BMW.